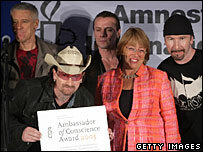 Rock band U2 have been honoured by human rights group Amnesty International at a ceremony in Chile. The Irish band's four members were named Ambassadors of Conscience at the National Stadium in Santiago de Chile. Amnesty International secretary general Irene Khan praised the group, fronted by anti-poverty campaigner Bono. She said: "Their leadership in linking music to the struggle for human rights and human dignity worldwide has been groundbreaking and unwavering." "They have inspired and empowered millions with their music and by speaking out on behalf of the poor, the powerless and the oppressed." U2 were also praised for their efforts to promote the Universal Declaration of Human Rights, which has been featured prominently at all U2 concerts on their current world tour. The Ambassador of Conscience award aims to promote the work of the human rights group through the example of its ambassadors. Previous winners include the first president of the Czech Republic, Vaclav Havel, and former Irish President Mary Robinson. The band chose to collect their honour at the National Stadium to remember those killed following a coup led by General Augusto Pinochet in 1973. Last week U2 played to about 150,000 fans in concerts in Sao Paulo, Brazil. Frontman Bono visited Brazilian president Luiz Inacio Lula da Silva and donated a guitar for auction to benefit his Zero Hunger anti-poverty programme.